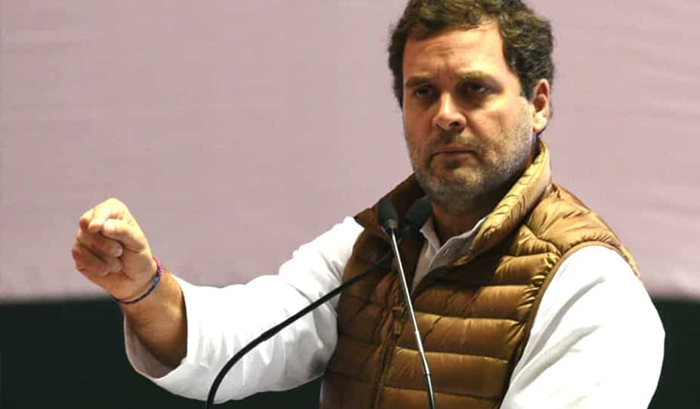 (Bhopal, Feb 09,2019):Aggressively continuing his barrage on the Rafale deal, Congress President Rahul Gandhi on Friday quipped that Premier Narendra Modi delivers lengthy speeches in Parliament and public meetings but does not speak for even a minute on the fighter aircraft purchase agreement. The Prime Minister spoke for approximately an hour and 45 minutes in the House of the People late Thursday but the ''chowkidar'' (watchman) did not even mention the plane,? the visiting politician averred while addressing the Aabhaar Sammelan (Convention for Expressing Gratitude) at Jamboree Ground in the capital of Congress-ruled Madhya Pradesh. Reiterating an allegation levelled in New Delhi, Mr Gandhi quoted Defence Ministry officials as saying that the Premier directly effected the understanding with France without briefing the Ministry.